When the First World War broke out in August 1914, hundreds of thousands of men answered Lord Kitchener’s call and enthusiastically signed up to serve their country. Patriotism and the mistaken belief that the conflict would be resolved in a matter of months meant that by the end of the year over a million men had signed up for the war. In Durham, young men, often close friends, left towns and villages in their masses to serve their country. Few knew the horrors of what lay ahead in what would become one of the most dreadful wars the world has ever seen. The nightmare of this so-called Great War was most exemplified by the Battle of the Somme in 1916, which took place one-hundred years ago this summer. For many the Somme not only confirmed the undeniable reality that there was no turning back but it would also prove to be, quite literally, the point of no return. 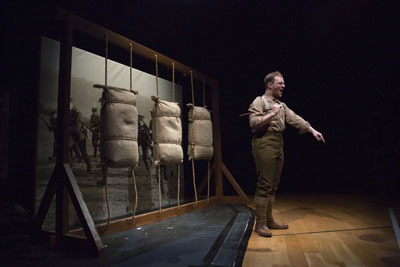 In remembrance of the Somme, Durham’s Gala Theatre is hosting ‘1916: No Turning Back’, a visitor experience and theatre production created by Studio MB and directed by Neil Armstrong. 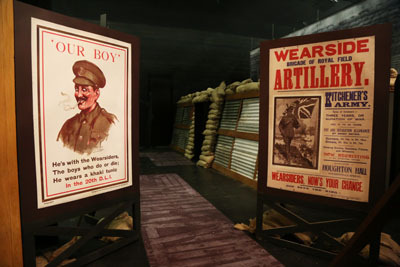 It aims to recreate, through actors, the story of the Somme from the angle of local lads and their families. It begins with the cheery eagerness of enlisting, then takes us through training before we find ourselves experiencing the terrible horror of the trenches. Ultimately it moves on to the devastating impact on families and survivors. It is a story tenderly told through the live performances of talented actors, accompanied in places by appropriate film footage. As I stood in the queue along with my daughter and a small group of tourist ticket holders – mostly couples in their fifties and sixties – I wasn’t quite sure what to expect. Like the enlisting soldier whose life it portrays, this was a date of uncertain destiny. I knew that if it was going to be true to its tale then there would have to be some sadness and horror, yet I also knew with much certainty that the chances are I would get out alive, but would it be entertaining, educating and moving? This is an experience told through actors, but it is not a traditional theatre production. Over the course of around 40 minutes, the actors interact with the visitors who are carefully ushered on a short walk-through of different stage sets that tell the story. Thankfully, there is enough balance between audience interaction and the sometimes deeply emotive stories of the actors to keep the visitor feeling comfortable and engaged. If the aim is to get you to imagine the experience of the soldiers of the Somme then it succeeds in this well. You are escorted through a series of stage sets partly recreated within the auditorium – though you won’t realise this – where seats have been removed. At the recruitment stage you hear the hearty banter of Second Lieutenant Simon Taylor as he has his photograph taken – in this case by my daughter – along with his Durham pals before you are moved on to the setting of Cocken Hall (now demolished, it was near Finchale Abbey) for our military drilling. Here, some ladies and gentlemen in the front row of our group are subjected to a fierce verbal dressing down by the drill sergeant, Jack Cotton. One of our group was then given the opportunity to take a stab at the enemy – in the form of a sack – using a bayonet rifle (of the blunted, retractable kind you will be glad to know). 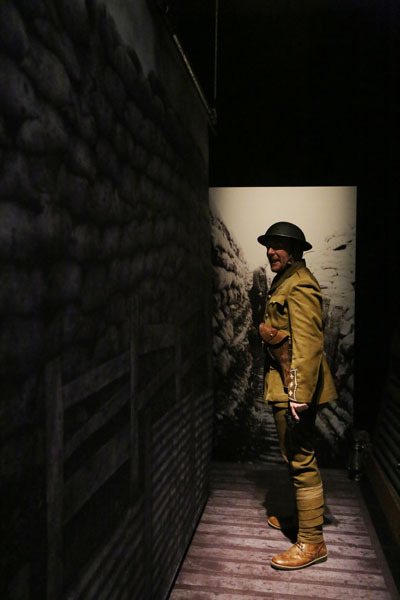 The best bit for me though, was the experience of sitting in the dark bunker deep inside the trenches of the Somme. For a few moments you will hear the constant realistically loud, thunderous pounding of shells above and around you as the nerve-shattered lamp-carrying Tommy recalls the horrific loss of his colleagues. With all the noise and sudden intrusion of theatre-effect smoke you will begin, during these few almost claustrophobic moments, to imagine the sheer terror that the trench-bound soldiers constantly endured for many months and years. Yes, it is an understatement to say you can only begin to imagine, but it is enough to make you think how fortunate you are not to have been there. Finally you are told it is time to go “over the top” in the terrifying though no less absurd sense of the phrase as it was used in the days of the First World War. For a moment I wonder if this could turn out to be “over the top” in some farcical ‘Blackadder Goes Forth’ moment as I picture a sudden, chaotic rush of tourists running across a staged battlefield but it is nothing of the kind. Instead the sombre emotion of the Somme’s story is appropriately maintained. So, as we alight from the trench onto the battle stage we are greeted with a veiled screen at which we stand, in line, briefly, watching black and white movie footage of the battle events. It creates a slightly dream-like out of body sequence that was perhaps not unlike that experienced by many on the battlefield. Post battle, our particular fates unknown, we move on to a field hospital room where we are greeted by a triage nurse, Sister Bailey and three beds with a kit of antiquated operating instruments lying upon one. 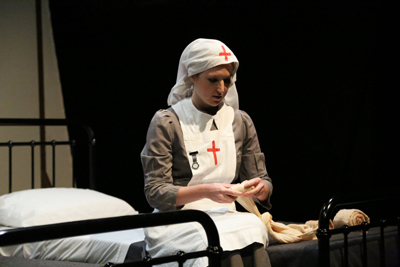 In a kindly but matter of fact, battle-hardened way the nurse explains her role and experience in caring for the wounded and dying of the frontline. We are are confronted by the sad reality of death and survival in this awful war. Other stages then take us on to a family home where news from the trenches arrives and then we head inside the home of a traumatised ‘lucky’ survivor whose story is told through the tender anxiety of his loving sister. Finally we learn the fate of Simon and his comrades and we are moved by the terrible futility of it all. So was I entertained? In places, certainly. Educated? Just enough. Moved? Undoubtedly. If I’m honest I’m not always a big fan of actors working in heritage attractions as the result can often seem fake or in your face, or even embarrassing. This is NOT the case here but in fairness it is not a museum or heritage centre but a theatre production with a difference where the audience is taken from stage to stage as a story is movingly told by experienced North East actors who effectively and professionally maintain just the right mood to move you. Some kids will enjoy it too, though in truth, my daughter, who is eleven and not a history fan, wasn’t particularly keen. She was a little on her guard from the beginning of the production/tour when the usher explained that there would be loud noises so perhaps she didn’t focus on the event. She was the only youngster there too – though I know this is not always the case – but this may not have helped. The actors included her in the experience and I’m certain lots of kids will enjoy the battle bunker and the banter, or seeing a parent getting some much-needed discipline at the training camp, so don’t let that put you off. All in all it is an unusual, interesting and moving commemoration of an important yet tragic event in our nation’s history. There are multiple performances each day with the production featuring two teams of North East actors: Luke Maddison, Samantha Neale, Lawrence Neale and Anna Nicholson who perform in rotation.